You should be ,Poor Dad is here referred his real father a professor who is totally dependent on the salary and has no investments. 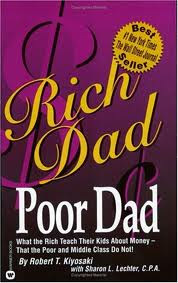 The Rich Dad here is referred to his friend's dad who teaches him financial management. The story has many instances where author demonstrates how he made money.He didn't share his mantra but shares what could be the best investment.How to invest is what he teaches.He says realty is good but shares are better those who are ready for that plunge.He has tried Forex,shares,realty investments.People say without finance you cannot do business but here Robert has demonstrated how finance can be managed.He says how to hold on to properties.Take an example purchased a House on loan ,payed installments for a year and then sold the house for double the principle amount,paid off the loan and interest ,still had good profit margin.Dont greed for big profits but for smart profits.So here it goes ,have financial stability and invest only with the profits not principle amount and loan. I am not saying this book will make you rich but it will financially educate you.not like the bookish financial books but with practical life examples. It's fun reading this book ..